What a fantastic way to display your collection! 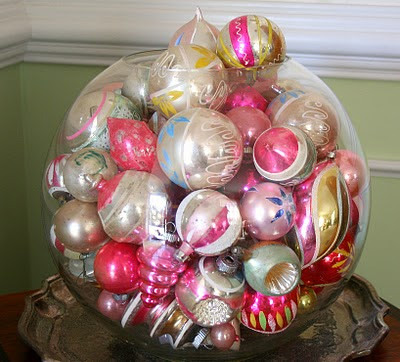 I have some of these bubble vases, but had not thought of using them in this way. Thanks for the inspiration. Your wreaths are inspiring too. I made two last year after seeing yours. They're so beautiful. Can't wait 'til Christmas! Drool! I NEVER find vintage ornaments! I found one lonely silver Shiny Brite at the thrift a couple years ago, and a couple of weeks ago, my cat knocked down the dish it was in and shattered it!